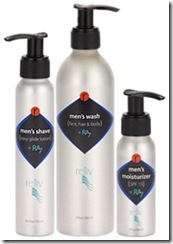 With the Men’s r Trio, Relìv is set, armed and ready to compete with this market! Men’s skin tends to be oiler (due to testosterone), thicker and more sensitive than women’s because of the daily shaving regime as you have heard me mention before. Our Men’s Shave Lotion + RA7 can help combat that stress and sensitivity – it moisturizes and protects your skin during the shaving process by allowing the razor to glide across your face minimizing nicks, cuts and abrasions. Just a thin layer is all you need; ladies it is great for you too! Following your shave with the Men’s Moisturizer + RA7 and SPF 30 is perfect to restore and protect your skin using vital skin nutrients; perfectly fine to use morning and night. The nutrients found in the RA7 complex are the same ones found in the Women’s r Collection as well and this unique combination can’t be found in any other single complex on the market! With the power of Pycnogenol®(Maritime Pine Bark from France) not only are you giving your skin powerful anti-oxidants, anti-inflammatories and anti-aging benefits but you are also heightening the skin benefits of the other 6 key nutritive ingredients. What does this mean to you? Better, faster and more dramatic results and healthier more vivacious skin! The more consistent you are with these products and with continued usage the better your skin will look and feel, and the healthier it will become.